Hello and welcome back for another fun card that I created for the Designer Challenge at My Creative Time. This time my fellow design team member Tracy has come up with a fun challenge to create a project with googly eyes. I use the Piles of Smiles stamp set from the My Creative Time Shoppe for my card. I paper pieced the turkey from this stamp set and cut out the circle frame with my Cricut and the Elegant Edges cartridge. The ribbon is from Liz's Paper Loft Boutique and the paper is from We R Memory Keepers. I am also going to enter this in the PDCC151 Challenge over at The Play Date Cafe. What a cute card Amy! Love the turkey! Thanks so much for sharing! Cute card! Thanks for playing at The Play Date Cafe! o this is so cute!! I love the little turkey!! This is so sweet, Amy! I love the Elegant Edges frame around the turkey, and the fibers you used are perfectly cozy for fall! Adorable turkey! Great paper piecing and frame! Thank you for sharing! this is sooo cute, amy! So stinkin' adorable! Love the stitching! Wow Amy!! This is just gorgeous! Love the papers and the ribbon and the stitching! You have amazing talent girlfriend!! 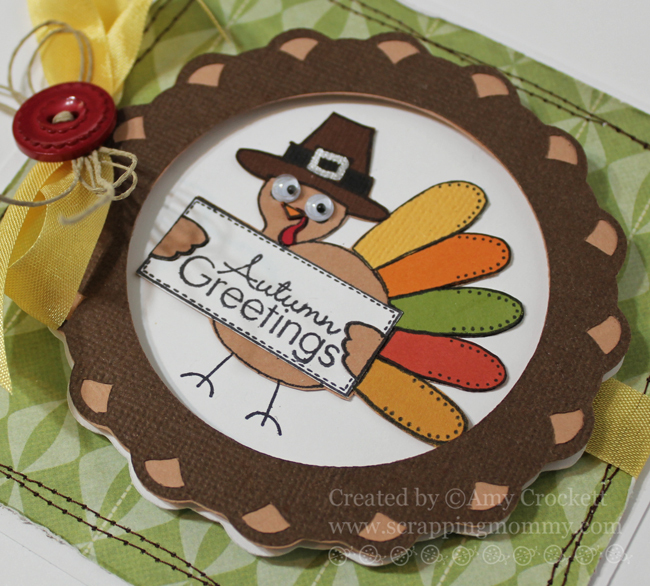 Great piecing job on your cute turkey card! Good luck with the challenge! this turkey card is awesome!! This is fabulous Amy!! Love all the different colored feathers on the turkey!! Great job!! Amy ~ this is just FABULOUS! The details, the sewing , the papers, that ADORABLE turkey and of course the googly eyes! LOVE!!! How super fun is this?! Thanks for joining us at The Play Date Cafe! Ack! Super cute! Love the paper piecing. Thanks for joining us at The Play Date Cafe! A wonderful and Fun card!Adorable Turkey!! !Awesome job on the stitching!